Capt. Jose Furtado has been an ocean Skipper since 1993. He has fished all his life, for more than half a century, starting fishing from the rocks at the age of three! By the time he was 12, he had bought his first boat, a kayak that allowed him to fish out at sea. After progressing through boats of increasing size through his life, he finally acquired the 'Alabote', when he was 35. Captain Furtado and his assistant delivered a nice leasurely coastal trolling experience (we caught a few baracuda’s, some lizard fish and some groupers) on a quality boat and with a top quality service and equipment. He knows the waters and the fish and speaks excellent English. Furthermore, he was very attentive to our 4 teenagers, explaining everything about the boat and the fish, and the ocean and the equipment, allowing them to go everywhere on the boat and try everything. If you look for a good fishing experience for a big family group, look no further. Book a trip with captain Furtado. We had a fantastic experience with captain Furtado and his crew. This is one of the best experiences we will remember. The boat was very clean, the food was delicious, the fishing equipment was very professional and you can notice the captain was putting all his heart into his work. It was an amazing day, that we recommend to all and we will definitely be back to see him off for another wonderful trip. 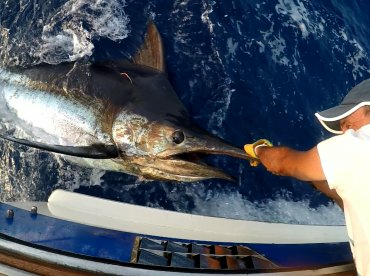 We chartered a whole day big game fishing trip with Alabote July 11th 2017 and had an amazing day at sea. We were told by the captain and owner Jose that this was our home for the day. And the boat was well stocked with water, soft drinks, beer, wine, snacks and lunch all included in the price. The lunch was prepared by the skipper Luis. Our crew Joâo and Luis were both very friendly and welcoming and did their upmost to see to our comfort. 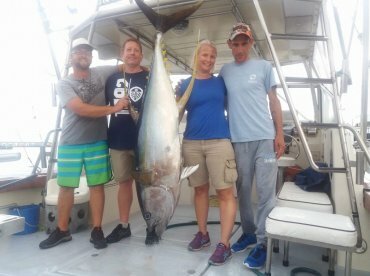 Their hard work with tireless search for fish throughout the day was awarded with apparently the first yellow fin tuna of the season. After a 2,5 hour fight the 125 kg (290 lb) beauty was caught. During the day we also had the company of countless spotted dolphins and even some sperm whales. Getting back ashore, we were greeted by Jose, and by his discretion we were received by Chief Joâo at La Cantina who prepared a delicious meal of sushi and grilled tuna steak. 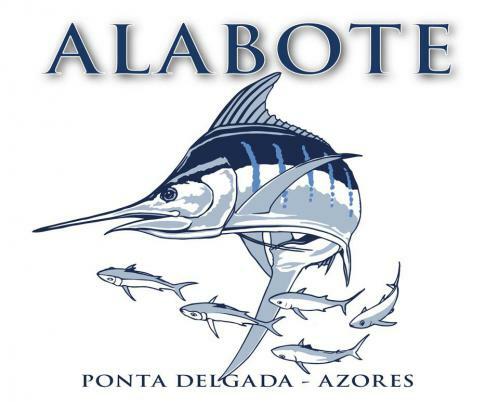 We highly recommend Alabote, and if you are considering big game fishing in Ponta Delgada, Alabote is the boat to book. We would definitely book again for our next trip to the Azores and Ponta Delgada. Thank you so much Mr. Svein. It was indeed a very nice day on the sea and we are more than happy that you have enjoyed that day with us. We just fish with passion! Thank you very much for your kind words and you are more than welcome whenever you want to come again. All the best from the Azores.